This pocket-money Music Finder file contains Music Finder titles and One Touch Settings settings for the 23 songs in the popular keyboard music album 'Easy Keyboard Library - Christmas Songs' (available from many good music retailers). All I Want For Christmas Is My Two Front Teeth ; Another Rock & Roll Christmas ; Frosty The Snowman ; Have Yourself A Merry Little Christmas ; I Saw Mommy Kissing Santa Claus ; Jingle Bells ; Last Christmas ; Let It Snow ! Let It Snow ! Let It Snow ! ; Little Donkey ; Little Drummer Boy ; Marys Boy Child ; Merry Christmas Everyone ; Mistletoe And Wine ; O Come All Ye Faithful ; Rocking Around The Christmas Tree ; Ruldolph The Red-nosed Reindeer ; Santa Claus Is Comin' To Town ; Silent Night ; Silver Bells ; The Little Boy That Santa Claus Forgot ; We Wish You A Merry Christmas ; When A Child Is Born ; Winter Wonderland. 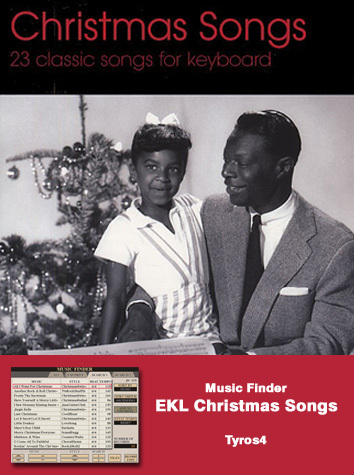 The Music Finder file - ‘EKL_XmasSongs’ should be copied to a USB stick.